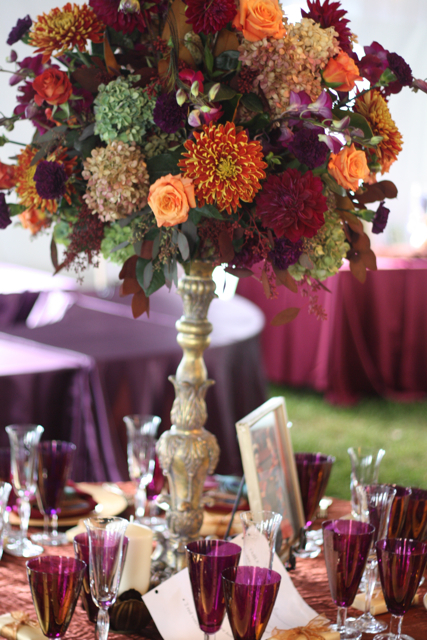 Amy and Chris's wedding had it all, and it was a pleasure to work on this very decadent event. 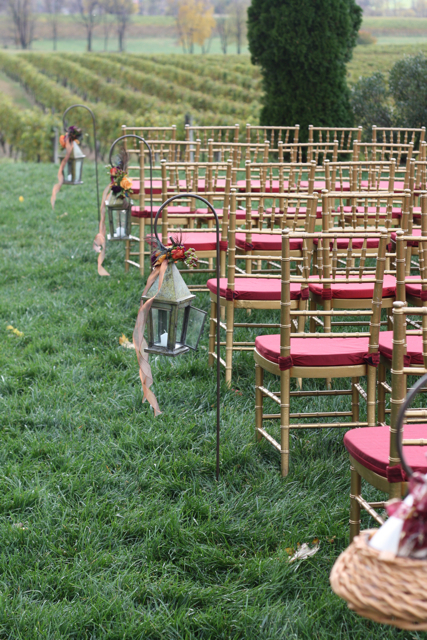 The wedding was at Breaux Vineyard, and the event planners were the girls from Events In The City. I totally loved all of the vendors on this job. Amy was all about rich vibrant tones. 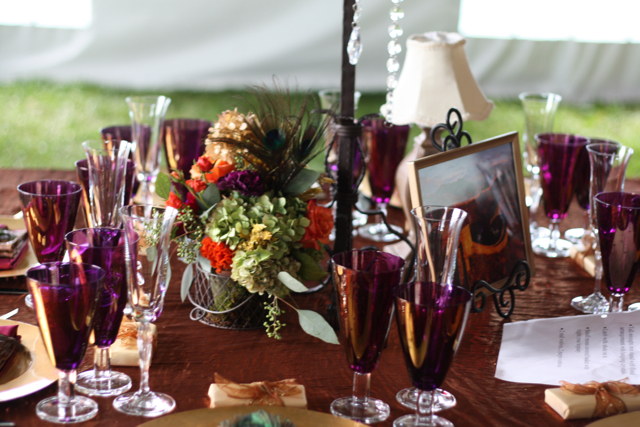 We used bronzes, coppers, deep purples and orange. 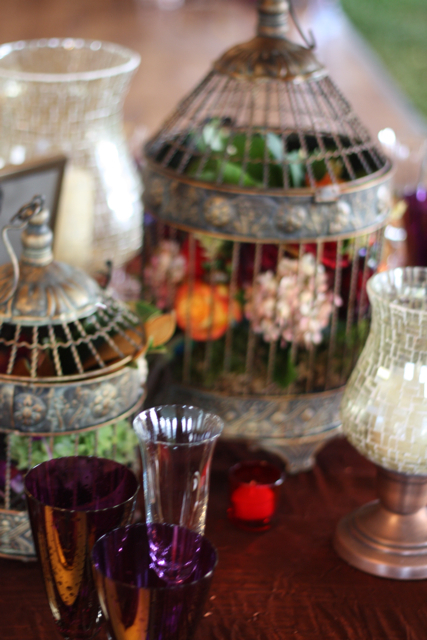 Feathers, twigs, vines, and crystals were elements used throughout the event. 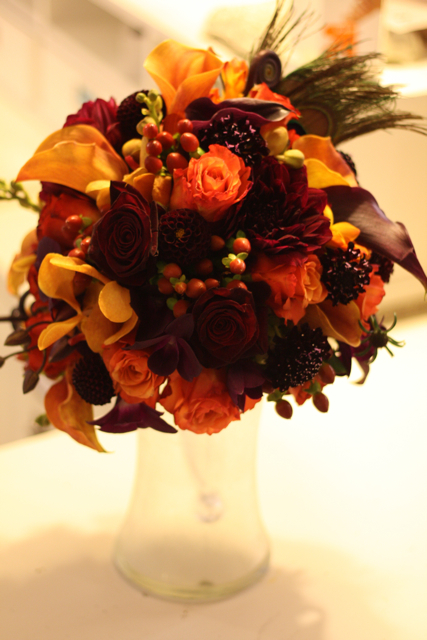 The bridal bouquet actually had feathers flying out of the design. The maids each had rhinestone buckles attached to the stems. So glamorous!!! 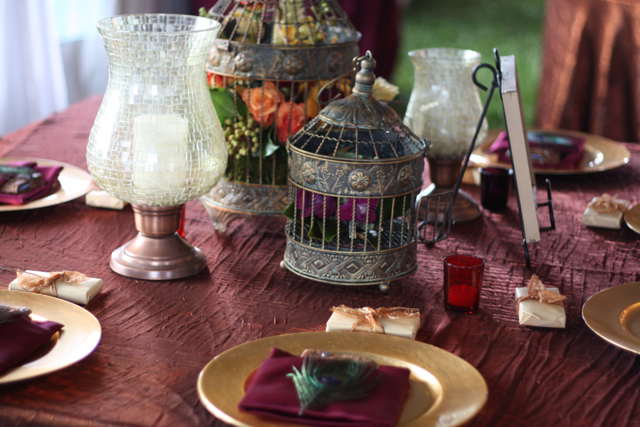 Every table was elaborately decorated with elements that Amy and Chris found. 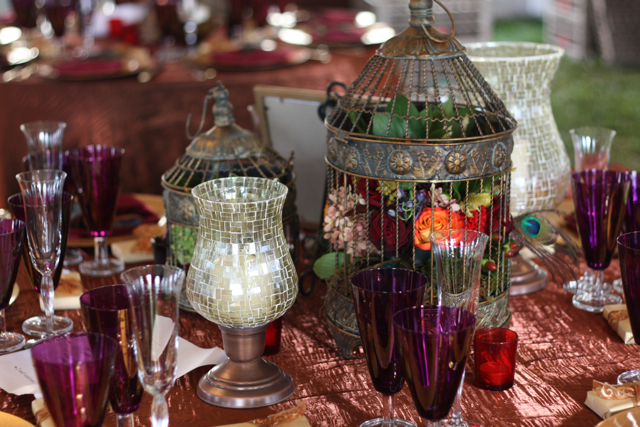 They used lanterns and bird cages to enhance my elevated gold and iron stands. 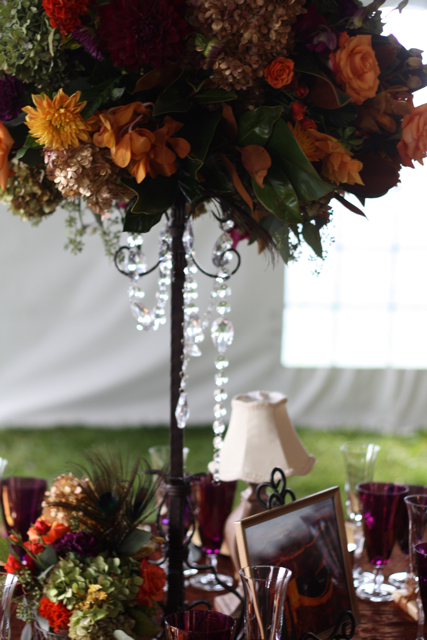 They bought jewels to hang from the centerpieces. 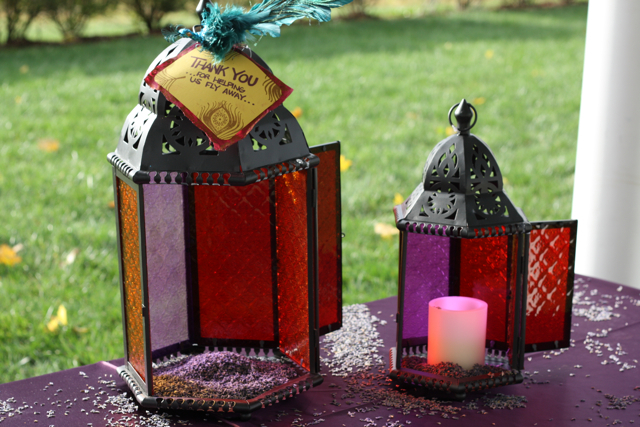 Amy even found little lamps, and she literally cut the cords off, so that they could become a part of the decor. 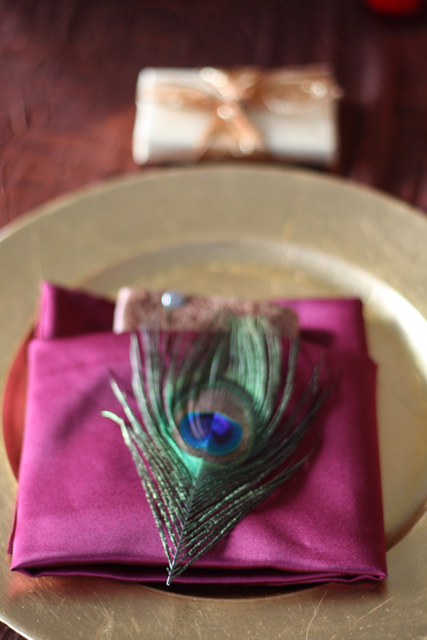 Every place setting had a beautiful peacock feather and a small little travel log tucked into the napkins. Amy and Chris spend much of their time working and traveling abroad. Travel became a huge part of their theme. Guests could fill up these lovely little gift bags with the sweets of their choice. 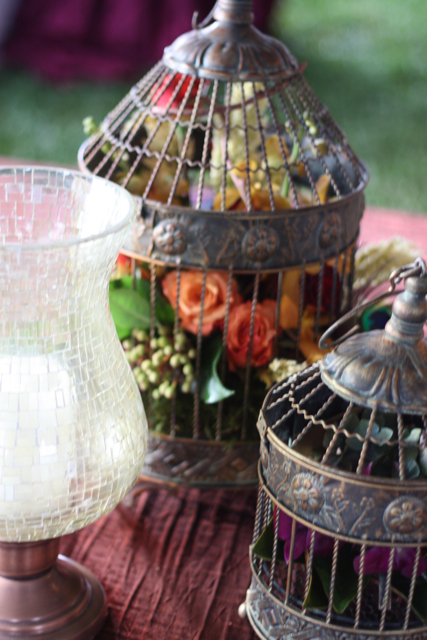 We hung lanterns down the aisle; after the ceremony they were added to the table decor. 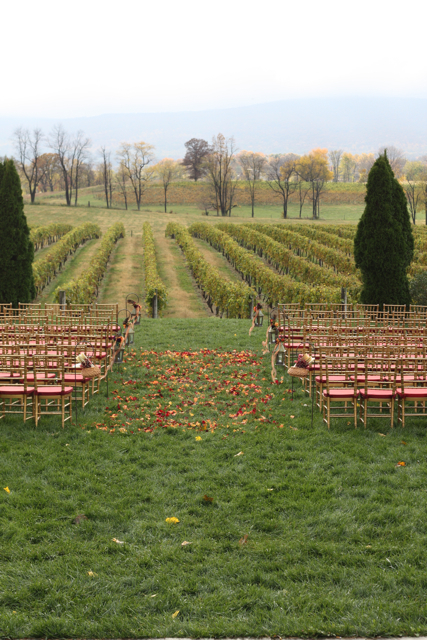 The wedding happened to take place outside in spite of some very rainy weather. Once the storms had passed, the sky became amazing. 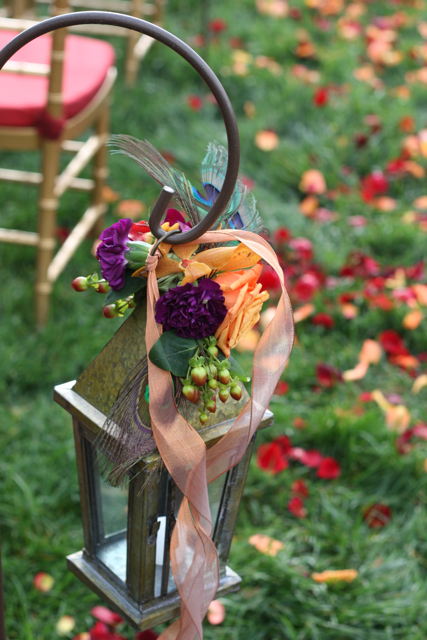 Guests could leave cards for the bride and groom who are planning to fly away on a trip around the world. I can't wait to show you the real images from this wedding. Happy married life Amy and Chris. We loved your wedding.